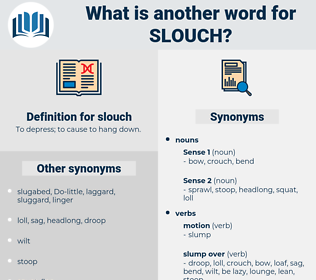 What is another word for slouch? To depress; to cause to hang down. have a genius for (doing) something. rustler, go ahead, hummer, self-starter, powerhouse, live wire, achiever, highflier, comer, doer, go-getter. Penny stood watching him slouch off down the street.
" It would be safe then to strike a match and look at the compass," suggested West, and, taking out his box, he struck a light, shaded it in his slouch hat, and then held the little pocket compass to it. 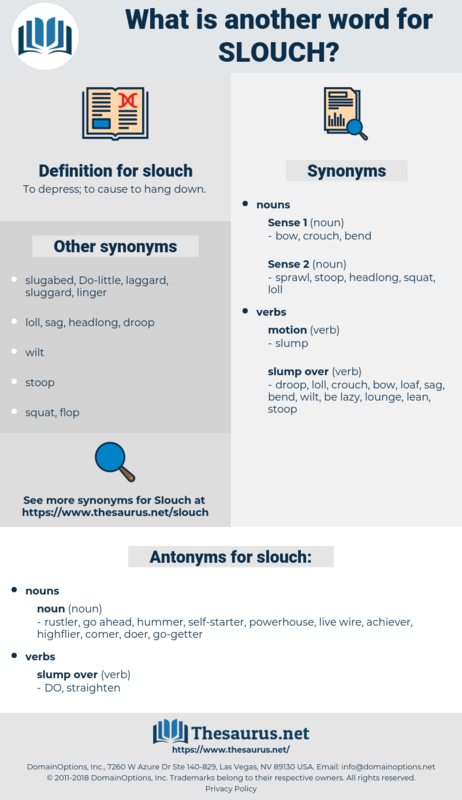 sialis, shigellosis, silk, saluki, salk, saclike, sea louse, shylock, silicosis, seleucus, soliloquize, slowcoach, sea slug, sloughy, silex, shlock, silage, slouchy, sluggish, saxicolous, slack, sulky, soul kiss, sills, shellack, sleazy, sleigh, saw log, seychellois, shell shock, slezsko, silky oak, slag, silky, sash lock, shoeless, suchlike, siliceous, skywalk, suslik, silicious, slash, salix, Seleucus I, silica, socialise, slushy, silk oak, slough, seychelles, saw logs, slick, shellac wax, silks, Sao Louis, schlock, soulless, scalelike, socialize, silique, slask, schulz, salacious, slush, suillus, sexualise, sleaze, sales, salicaceae, slews, silesia, scalic, scale wax, sls, squelch, soleless, Siskiyou Lewisia, shekels, shoe lace, scallywag, soliloquy, siliqua, sexualize, skulk, sulcus, syllogize, sclk, solace, squalus, saw-like, selachii, schoolhouse, slog, sulawesi, sacculus, sluiceway, Sauce Louis, salish, slug, souslik, scalawag, soliloquise, scaleless, syllogise, scoliosis, slacks, scalage, shellac, sleek, sexless, soleus, slosh, slake, seles, shoelace, sluice, sociology, slice, sulk, sillago, salsa, shell-less, Seljuk, shillelagh. sag, walk, droop, swag, flag.